This bloggers moment of glory with Yewande Omotoso. The Sunday Salon. It came to us in 2008 as a new space Nairobians could enjoy listening to literature apart from the Kwani Open Mic which had become a bit crazy with the drinking in that gig going into the wee hours of the next morning. In that year, we had writers like Muthoni Garland, Zukiswa Wanner and Dayo Forster giving us some of their best prose. There were a few Sunday Salon events which then included emceeing by June Wainaina and singing by Antony Mwangi. The event then went quiet for a few years before reappearing last year when the Granta Novelists were in town for an afternoon of much fun. Then again quiet. Former emcee extraordinaire June is no longer active in the literature scene and the singer at the time is now a highly acclaimed singer actor called Anto Neosoul with a highly regarded album Starborn recently out. 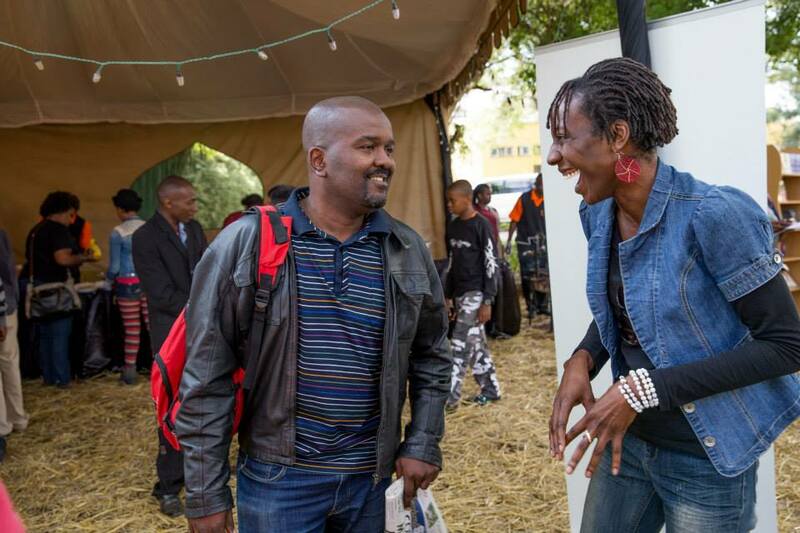 This Sunday saw the return of this the prodigal son of Kenyan literary events. This time round the list of writers on the bill were quite impressive; Noviolet Bulawayo, Yewande Omotoso and Karen Jennings. These three were the shorlistees for the Etisalat Prize for African Literature 2014 doing their Nairobi tour. Jennifer Makumbi; she was the winner of the Commonwealth Short Story Prize. Okwiri Oduor and Billy Kahora; these folks are shortlisted for the Caine Prize 2015. They all came on stage and did their readings these writers with the famous work. The most even of the readers were Yewande Omotoso, Billy Kahora and Karen Jennings as one felt their home voice as one listened. The more interesting voices for this blogger were from the other readers. Noviolet Bulawayo has been in the US for years and years but you could still hear her strong Shona influence as she read from We Need New Names. Jennifer Makumbi on the other had has been in the UK for a similar number of years but she seemed to have morphed her voice into a weird Luganda Mancunian accent. The strangest one was from our Okwiri who had been to the US for only six months but was speaking in an accent that I cannot even describe; US Nairobian? That writer was difficult for me to follow as she seemed to be swallowing her words; lucky for me I have already read My Father’s Head so I could just drink my cold Tusker and think that this is none of my business like Kermit does in all those memes. After official proceedings which including chatting with the like of Quaint’s Paul Munene and boss of content over at Spielworks Oyunga Pala and Alexander Nderitu of e-book fame and a whole bunch of folks we settled into afterparty mode. There was much drinking and laughing at that Kwani offices with Isaac and Barbara and Zuki and Jackie L and Muraya Ogutu and Velma and Billy Kahora and the rest of them. That was one of the best literary event I have been to all year. Lets hope Sunday Salon happens not after a year. Pretty please? :-). I love how you described the accents. I’ve heard Jennifer Makumbi’s accent on the radio and it sounded really posh. I’ve also watched an Okwiri Oduor being interviewed on Youtube (in Swahili) and she spoke some interesting Swahili. But don’t hold it against anyone, accents depends on many things. Thanks for the comment Lara. There was a lot happening at that Sunday Salon and I wanted to pick up something that the writers had in common that humanised them. The writing on all counts was very high quality so I needed something else. I find the accents that they exhibited at the event quite remarkable as they all started on the continent but their influences changed how they spoke and I was stuck by this which is why I picked on it in my blog.